Don't forget, we have two half day sails and lobster bakes coming up! One on Tuesday, July 30th from 2:30-8:45pm and one on August 6th from 2:30-8:45pm. You don't want to miss these special trips! Join us for one of our most popular special trips on July 30th from 2:30-8:45pm! Enjoy an afternoon sail around the beautiful Penobscot Bay and through the amazing archipelago of Islesboro to Warren Island. Explore the island while we prepare a traditional Maine Lobster Bake for you! Visit our website or call us at (207)236-2323 to make a reservation or to get more information! Don't miss our special new sail! On Thursday we will be having our first seabird watching sail! Enjoy an early morning sail through the beautiful islands of Penobscot Bay as FOMSI (Friends of Maine's Seabird Islands) teaches us about the local seabirds! Join us on July 12th for the Windjammer Parade! The Schooner Olad will be participating in a parade of sail around the historic Rockland Breakwater with other tall ships of the Camden/Rockland Windjammer Fleet! Don't miss this special opportunity, buy your tickets today! Can you believe that tomorrow is the first of July? Start the month off right by joining us for a sail aboard the Schooner Olad or Sailing Vessel Owl! Also, we still have availability on our sails this weekend! Come enjoy the holiday weekend and the warm weather from the comforts of our vessels as we sail the beautiful Penobscot Bay! Fourth of July is right around the corner and what better way to celebrate your holiday weekend than with a sail aboard the Schooner Olad or Sailing Vessel Owl? Our fireworks sail is sold out but we do have availability on our other lovely two hour sails throughout the weekend! Also, don’t miss the special opportunity to sail with us on Friday, July 5th and be part of the Great Schooner Race, North America's largest annual gathering of tall ships! We are filling up fast so don't wait, buy your tickets today! Start the summer off right and come join the Schooner Olad for her annual Sunrise Sail on Friday, June 21st from 4:15-6:15am! Sail the peaceful Penobscot Bay and watch the sun as it rises over the beautiful islands. It is truly a magnificent sight to see. Coffee, tea, pastries, and fresh fruit will be provided. Don't miss this special opportunity! If you are looking for a more private trip or custom charter don't forget we added a new boat to our fleet this year, the Sailing Vessel Owl. The Owl can hold up to six passengers and is the perfect place to have a more intimate or personalized trip! Looking for the perfect gift for dad on this father's day? Why not treat him to a sail aboard the Schooner Olad! 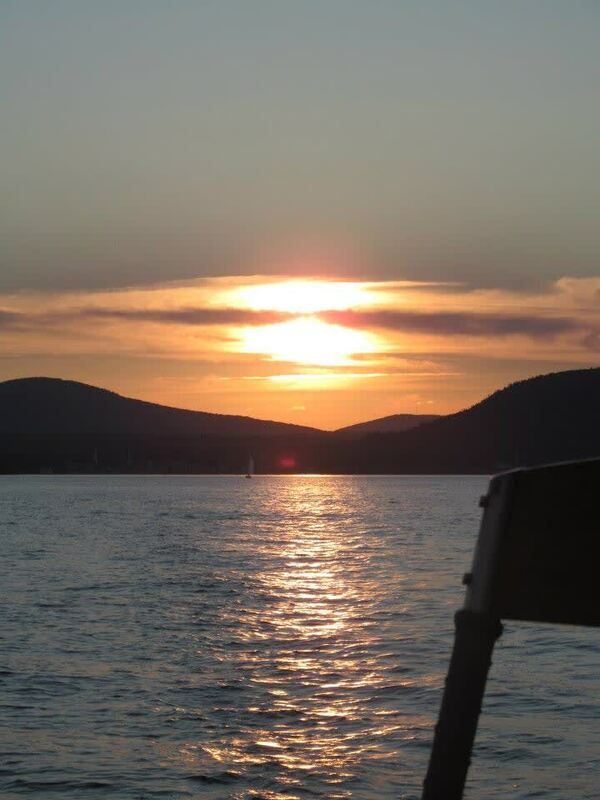 Show dad that he is doing a great job by taking him sailing out on the beautiful Penobscot Bay. Dad will receive half off the regular rate when accompanied by a family member! If you are looking for a smaller trip take dad out on our other ship, the Sailing Vessel Owl! We are extending our father's day discount to Owl tickets as well! Also, if you would like to charter the Owl on father's day we will take $50 off the original price when dad is accompanied by a family member! Don't miss this special opportunity, call us at (207) 236-2323 to purchase your tickets today! The first flowers of the season popped out of the ground last Month. Today, the Schooner Olad sits at the dock ready. The crew of the Olad is already in high gear getting her in tip top shape for our Thursday, May 16th season opening. A special thanks to those of you who have already made plans to come back this season, we are thrilled to be a part of all of the weddings and special events you have planned. We would also like to thank the Friends Of Maine's Seabird Islands for working with us to offer a special bird watching trip to be held July 18th. That is just one of the many special events we have planned for the season. For the complete list please visit the Upcoming Events link on our website: www.maineschooners.com or give us a call (207)236-2323. Camden Harbor is the home port to our new sailing vessel Owl. I have been looking around for a while now, imagining a second boat. A boat that could do longer, more private trips like lobster bakes, island picnics, and destination sailing like Nebo Lodge on North Haven. When I came across Owl this winter, it was love at first sight. She is a timeless classic, designed by the world famous yacht designer John Alden. Owl was built in 1941 to be a fast comfortable cruising boat. She has been completely restored to the highest standards and is ready to take you sailing. Owl will provide you with an unique experience. She will take up to six passengers making her the most private and intimate wooden sailboat in Camden Harbor. I am really excited about this season, and a little overwhelmed with our two boats. Yet, it all this activity that keeps me alive and well. Classic sailing boats is what I do best. I look forward to welcoming you aboard. One of the things we like to do on the Sailing Ship Olad, is to donate our time to great causes, like Youthlinks. They are currently fund raising through a fabulous raffle, where you could win a phenomenal “Maine Vacation.” The tickets are only $25.00, and there is only one month left to buy them at: www.mainedreamvacationraffle.com So please help them, and buy some tickets. The lucky winner and companion will enjoy three nights at the Samoset Resort on the Ocean, including a round of golf. They will dine each night at a different restaurant: La Bella Vita Ristorante, Rockport; the Craignair Inn & Restaurant, Spruce Head; and The Youngtown Inn & Restaurant, Lincolnville. The winner will also be treated to a biplane tour over Penobscot Bay, courtesy of the Owls Head Transportation Museum, passes to the Farnsworth Art Museum, Rockland and of course a sail aboard the Schooner Olad, Camden. Youthlinks is a program that provides after-school programs that include community service, leadership and enrichment opportunities to all youth anywhere in mid-coast Maine. Teens in the after-school programs learn skills, build self-esteem, cultivate social responsibility, develop leadership abilities and connect to their peers, to adult mentors, and to their communities. After-school programs are free for participating youth. Youthlinks is funded through a combination of state grants and the generous donations.